Consumer Reports, a consumer assistance publication, recently performed an extensive testing on the iPhone 8, iPhone 8 Plus, and iPhone X along with other smartphones and published the results of its iPhone X tests based on display, camera, battery life and durability. The publication concluded that Samsung’s latest smartphones, and even the cheaper iPhone 8 series, are better options for most people. While Consumer Reports called the iPhone X an “innovative device with a fantastic camera and beautiful display” and mentioned it in the recommended list, it lost out to its predecessors, iPhone 8 and the iPhone 8 Plus in a full comparison of the phones in the durability test category. The iPhone X did make it to the Consumer Reports list of top 10 smartphones, but the iPhone 8 and iPhone 8 Plus proved “hardier” when it came to a tumble test for emulating real-world drops and fumbles of about 2.5 feet. Although iPhone X performed well in the initial drop tests, it didn’t fare so well after more extensive testing. 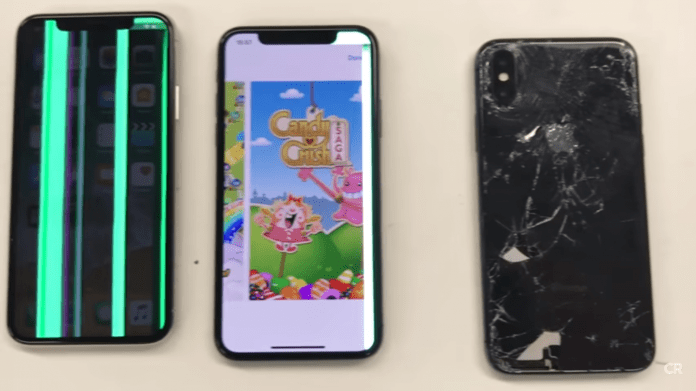 We tumbled three samples of the iPhone X. The first was fine after 50 drops, but the glass on the back was significantly cracked after 100. The other two phones ended up with malfunctioning displays after 50 drops. Though the front glass didn’t crack, several bright green bars stretched across the screens from top to bottom. On the other hand, the iPhone 8 and 8 Plus had ended up with just a few scrapes after the durability and drop test. Further, front displays of the iPhone X, 8, and 8 Plus all came away unharmed. While the iPhone X did well on scratch tests and water resistance tests, it did not fare well in terms of battery life. The iPhone X managed to last for 19.5 hours, as opposed to iPhone 8 Plus and Samsung Galaxy S8 that lasted for 21 hours and 26 hours respectively. The iPhone X’s battery life has impacted its overall score the most. In general, Samsung Galaxy S8 and the Samsung Galaxy S8+ are the top two recommended smartphones as per Consumer Reports, primarily due to superior battery life. These two smartphones are followed by the iPhone 8 Plus and the iPhone 8 in number third and fourth position respectively. Although, the iPhone X is at the bottom of the list at number nine, it is only separated by a few points from all the devices tested. You can read the full review of iPhone X at Consumer Reports. Give me a break. iPhones never had any durability whatsoever. If you’re gonna get an iPhone, be prepared to treat it like a baby.